This packet sows up to 42 feet. Late planting your garden? 'Shin Kuroda' is quite heat resistant, so don't hesitate to sow in late spring, and even into the summer (when you might be doubtful about sowing carrots). Shin means "new" in Japanese, which alludes to its improved, tapered, 5"-long roots with wide shoulders, that grow through heavy soils with ease. Simply unsurpassed for flavor—one of the sweetest carrots you will eat! Plant Dimensions: Roots are 5" long at their peak. Variety Information: Smooth, tapered, deep orange/red roots with blunt ends. High moisture content contributes to its superior flavor. 'Shin Kuroda' is a chantenay type carrot. Thinning: When 1" tall, thin 1 every to 3"
Harvesting: For best flavor and texture, harvest carrots before they get larger than their optimal size. Peak harvest period lasts about 3 weeks, longer in the fall. Late summer sown carrots are sweetened after having been kissed by light frost; however, harvest before soil freezes, which might destroy the crop. 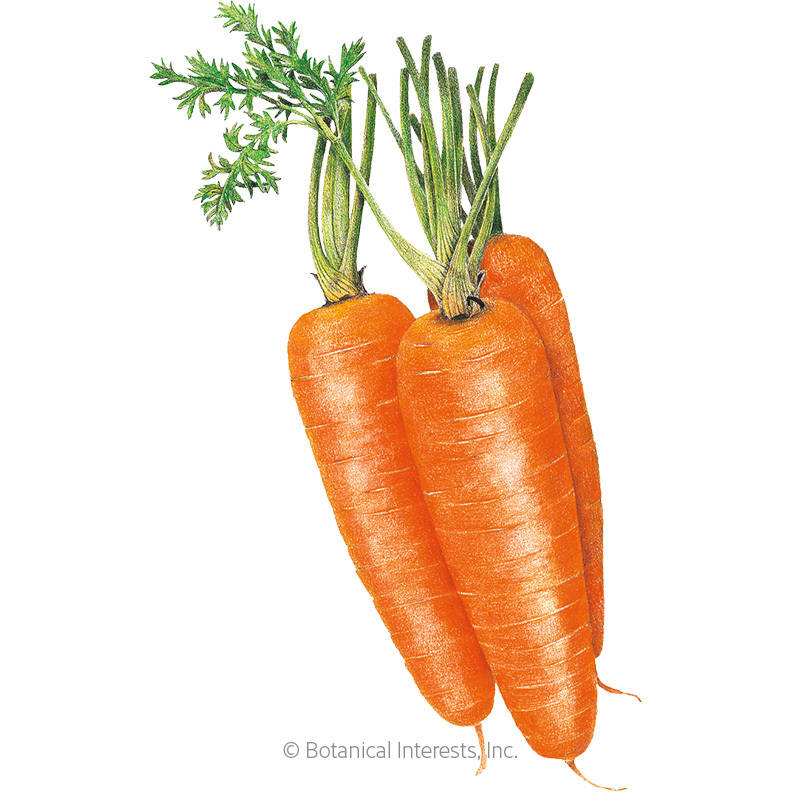 In USDA zone 5 or warmer, carrots can be left in the ground for storage provided they are heavily mulched; harvest as needed on days the ground is not frozen.